Many of us enjoy a relaxing manicure after a tiring work week. In fact, it has become a habit of sorts. Aside from helping maintain the health of our nails and hands, it has become a way for us to unwind and spend time with our girl friends. Needless to say, we also just can’t resist the allure of perfectly polished nails. 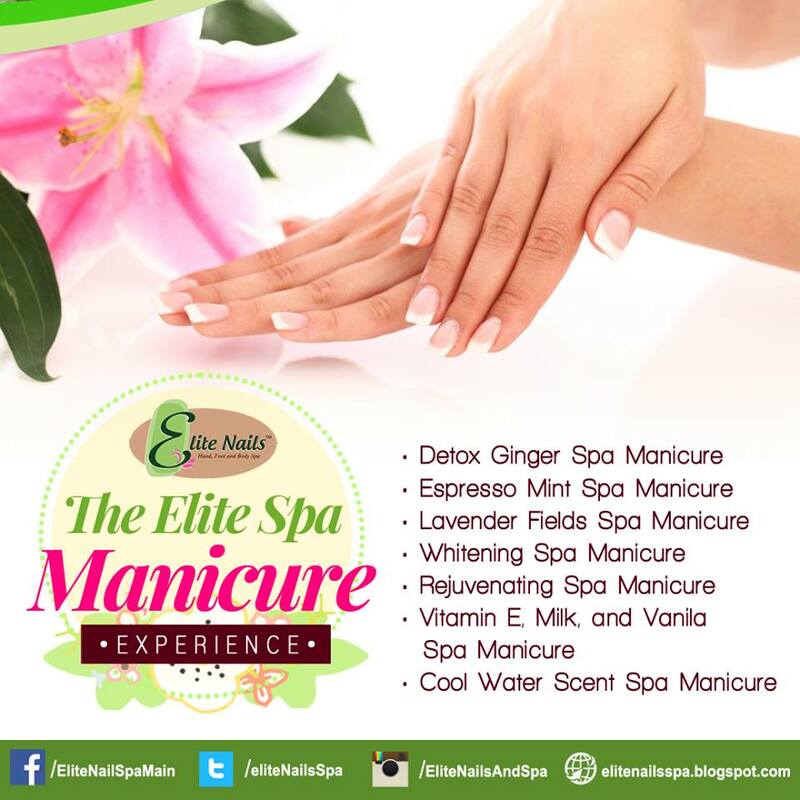 The Elite Spa Manicure Experience is unlike any other you have experienced. We are quite meticulous in ensuring that you get clean and healthy nails and hands, perfect polish, and absolute pampering. You definitely get your money’s worth with our 8-step manicure experience starting from soaking, followed by scrubbing, masking, hot towel wrap, manicure, hand butter, moisturizing mist and finally, polish. It is always exciting to choose the style and color of nail polish for your next manicure session. Here at Elite, we make your manicure experience even more memorable. You don’t only get to enjoy a range of branded and high quality polish, you can also choose the treatment that best suits your needs. Depending on the condition of your nails and hands, you can choose from an array of treatment that allows you to maximize the benefits of getting a manicure. We have seven manicure treatments that you can choose from including Detox Ginger Spa Manicure and Whitening Spa Manicure. Our friendly staff will help you assess your needs, and you can simply sit back and relax while we do our part to ensure that you have beautiful hands and nails. Schedule your next manicure session now!